Onion – Onion is very commonly vegetables in India. Without onion there is no taste in vegetables dishes, pulses and meat. It is also popularly known as Pyaz in Hindi. Onions are most commonly cultivated and used in several dishes of vegetables, pulses and non-veg dishes in the world including India. It is also used in making pickles or chutneys. When the onions are chopped and have chemical substances that irritate the eyes. Types of Onion – There are several types of onions such as yellow onions, sweet onions, white onions, red onions, green onions, spring onions, and pearl onions. Lower the risk of cancer –Red onions are beneficial in prevent breast, colon, prostate, endometrial and lung cancers because it contains quercetin and anthocyanin which acts as an anti-cancer agent as per research. Onions make the situation unfavorable for cancer cells to connect and prevent their growth. The individual who daily intake onions, had the lowest possibility of several types of cancer such as gastric cancer, colorectal cancer, laryngeal cancer, ovarian cancer, oral and esophageal cancer as per research. Prevent heart diseases – Red onions contain flavonoids and organosulfurs which are beneficial to prevent cardiovascular disease. Onions also has thiosulfinates which can help in lower the risk of heart attack and stroke as per research. The quercetin is present in onions acts as an antioxidant and anti-inflammation properties which prevents several heart diseases. Reduce cholesterol – Onions are also helping in reduce cholesterol which are beneficial for strong heart health. It contains flavonoids that decrease the LDL (bad cholesterol) as per study. Control blood pressure – Onions are used in decrease blood pressure which are also beneficial for heart. Decrease blood sugar level – As per research, onion are beneficial for control sugar level in the blood. The sulfur are present in onion helps in reduce blood sugar level by increasing insulin production. The onion contain quercetin is also helps in control blood sugar level. Improve eye health – The onion contains sulfur which is useful in better lens of the eye. It is rich in glutathione which is helpful in lower the risk of several eye diseases such as glaucoma, macular degeneration, and cataracts. The onion also has selenium which protects the cells in the eye. Strong teeth – The thiosulfinates and thiosulfonates (the sulfur compounds) are present in the onion are useful in decrease bacteria which cause tooth decay. It contains vitamin C that keeps strong teeth and relieves tooth pain as per research. Cure blood clots – Onions has a rutin that are used in cure clotting in the blood and also block the enzyme which is released very fast when blood clots form. Improves bone health – As per research, white onion containsa compound known as GPLS which keeps strong bone. The quercetin are present in onion can prevent leukotrienes,prostaglandins, and histamines that cause inflammation in osteoarthritis and rheumatoid arthritis as per research.Onions are also used in treat joint pains. Maintain respiratory health – If an individual consuming daily onion in a diet then relief in respiratory illness. 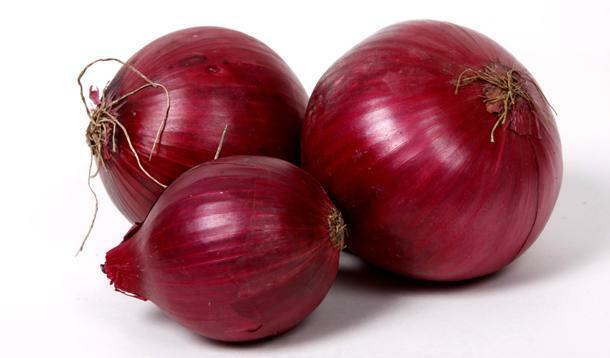 Onions are also helpful in asthma and allergic rhinitis as per research. Improve skin health – Onions contain vitamins A,C, and E protects the skin from early aging which is affected by free radicals. It can also protect skin from bacteria. Vitamin C is present in onion is main for glowing skin. Beneficial for hair growth – The onion juice has sulfur which is used for strong and thicker hair growth. The sulfur can also promote collagen production that helps in healthy skin cells and hair growth. Onion juice in hair can rise in supply of blood to the hair and increase hair growth. Prevent dandruff in hair – Onion is also used in prevent dandruff in hair which helps in strong hair growth. In my case, I cannot imagine preparing any dish without onions. Luv me some onions. I add it to most meals!